The cover of the first volume, featuring Satō. 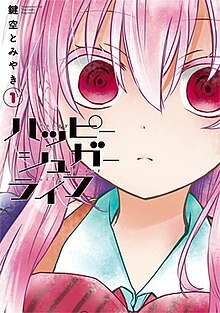 Happy Sugar Life (Japanese: ハッピーシュガーライフ, Hepburn: Happī Shugā Raifu) is a Japanese psychological thriller manga series written and illustrated by Tomiyaki Kagisora (鍵空とみやき). It has been serialized in Square Enix's shōnen manga magazine Gangan Joker since May 2015. The series is licensed by Yen Press. An anime television series adaptation by Ezo'la aired during the Animeism programming block between July and September 2018. The series is centered on high school girl Satō Matsuzaka who befriends a mysterious little girl named Shio, and immediately falls in love with her. She kidnaps Shio and keeps her in her apartment. She vows to protect that feeling of love, even if it means committing crimes. The protagonist. A teenage girl who falls in love with Shio and keeps her in her apartment. She maintains a kind facade in public in order to earn money for her and Shio, but will resort to anything in order to protect Shio. She is a first year high school student at Makiko High School and also works at a cosplay restaurant called Cure á Cute as a waitress in order to support both Shio and herself. She dies after falling off her burning apartment building while allowing Shio to live. An innocent little girl who lives at Satō's apartment. She cares for Satō deeply but often remains unaware of what she is involved in until the far off episodes, she is not allowed outside of the apartment. In the final episode of the anime, she sustained minor injuries and ended up in the hospital after hugging Satō as well as pushing them both off the roof of the apartment with Satō (who died from the fall). After Satō's death, Shio keeps Sato's wedding ring and her hair ribbon as a memento to remember her act of heroic sacrifice, she also claims that she has been reborn as Satō, much to Asahi's horrific shock and believes that Satō will be reborn in the future. A boy who is searching for the whereabouts of Shio. He's later revealed to be Shio's older brother; it's hinted that he had romantic feelings for Shōko after she stole his first kiss, and when he finds Shōko's corpse in the fire he is devastated. In the final episode, he is shown visiting Shio in the hospital. A high school boy who works alongside Satō at a family restaurant. Being held captive and raped by his former boss causes him to develop a great fear of older women. First laying eyes on a flyer of Shio's disappearance, makes him finds comfort in Shio's innocence and becomes obsessed with her. In the final episode, he became emotionally broken due to being raped by Satō's aunt and under his belief that Shio died from the fire, implying that he is permanently stuck as a recluse. Satō's best friend and co-worker who comes from a rich family. She is killed by Satō after discovering her secret relationship with Shio. Her body is eventually burned in the final episode, though the police manage to identify her and arrest Satō's aunt as a result. Satō's high school teacher. Underneath his handsome looks and friendly personality, he is revealed to be a pervert with sadomasochistic tendencies who is obsessed with Satō. Threatened to have this revealed to his family, he is forced to dispose of some evidence for Satō. In the final episode, he is taken by the police to be questioned for the crimes he committed. A relative of Satō who had taken full custody of her after her parents died many years ago. It was thought that she may have been killed by her own niece since she was mostly shown in flashback sequences when Satō was a child. However, it is revealed that she is alive, apart from a few parts of her body which are seen covered in bandages. Despite her happy and cheery nature, she is actually mentally unstable as well as being deeply insane, and she accepts all forms of desires towards her with disturbing masochistic pleasure. Her deeply twisted views of love are held responsible for making Satō think in a similar fashion. She lives in the same apartment complex as her niece but is in a different room floor. In the final episode, she is arrested for arson and first degree murder of Satō and Shōko (even though Satō was the one responsible for Shōko's death). Satō's next-door neighbor and co-worker who refers to her as "senpai", having a crush on her. Just like Satō, Shōko, & Taiyo, she attends a different school. Asahi and Shio's mother. Originally a kind-hearted woman, she was forced to marry a man she did not love after she was raped and then got pregnant with her two children; she is featured in the flashbacks of her children and in her backstory. It's hinted that she suffered from bipolar disorder mostly due to the domestic abuse that she had suffered from her husband who later died from alcohol poisoning but it is later learned near the end of the series that she had poisoned her husband. In the final episode, she is shown standing outside of the hospital that her daughter, Shio is being treated at. Tomiyaki Kagisora launched the manga in Square Enix's shōnen manga magazine Gangan Joker on May 22, 2015. Eight tankōbon volumes of the manga were released between October 22, 2015 and June 22, 2018. On July 8, 2018, during their panel at Anime Expo, Yen Press announced that they had licensed the manga. The anime television series adaptation is directed by Keizō Kusakawa and Nobuyoshi Nagayama and written by Touko Machida, with animation by studio Ezo'la. Shōko Yasuda is providing the character designs. Youko Matsubara is the color key artist for the series and Kiyotaka Yachi is directing the background art. Yasuyuki Itou serves as director of photography, while Yayoi Tateishi is the sound director. The series is edited by Yuuji Oka. Koichiro Kameyama is composing the series' music. The opening theme song, "One Room Sugar Life" (ワンルームシュガーライフ, Wan Rūmu Shugā Raifu) is performed by Akari Nanawo, and the ending theme song, "Sweet Hurt", is performed by Reona. The 12-episode series aired in Japan between July 14 and September 29, 2018,[a] broadcasting during the Animeism programming block on MBS, TBS, BS-TBS, and AT-X. The series is being simulcast exclusively on Amazon Video worldwide. "The Sugar Girl Eats Love"
The episode begins with two young girls standing on the roof of a burning building while agreeing to contemplate suicide together. Satou Matsuzaka, who previously had a reputation for playing around with men, has started living with the person she loves: a little girl named Shio Koube. As Satou takes on a part-time waitressing job at a restaurant called Princess Imperial to raise money for Shio's sake, she turns down a love confession from fellow employee Taiyou Mitsuboshi, who stops coming to work the next day. As Satou is forced to work overtime for less pay, she confronts the manager and goads her into admitting that she kidnapped and molested Taiyo. Upon revealing the confession has been recorded on her cell phone, Satou blackmails the manager into paying her withheld wages. While Satou returns home to Shio, keeping quiet about a room in their apartment containing bloodied trash bags, a boy named Asahi puts up posters listing Shio as missing. Upon getting the feeling that someone is watching her, Satou deduces that her school teacher, Daichi Kitaumekawa, is the one stalking her, narrowly managing to avoid being assaulted. The next morning, Satou threatens to expose Kitaumekawa's deeds to his family, coercing him into disposing of some unwanted evidence for her. Later, Taiyou, who has begun harboring an obsession with Shio after seeing her poster, comes across Asahi being beaten up and takes him to Satou's workplace. Hearing Asahi murmur the same "marriage vow" that Shio does with her every night, Satou contemplates killing him. "The Sugar Girl Doesn't Notice"
After Shio passes out from experiencing frightening visions of her mother, Satou arrives on the scene and brutally kills them before taking Shio back to her apartment. As Taiyou, who had seen Satou run off with Shio, becomes curious about her motives, one of Satou's co-workers, Sumire Miyazaki, is seen sniffing Satou's uniform. "The Taste of Crime and the Taste of Punishment"
Satou discovers that Sumire has been going through her locker, learning that she is obsessed with becoming just like her. When probed about where she lives, Satou kisses Sumire to stop her prying further. Upon returning home, Satou discovers Shio in turmoil over memories of her mother, feeling it is punishment for lying about not talking to anyone. Satou, who feels guilty about telling someone else she loved them, confesses her "crime" to Shio, and the two manage to calm each other down. Meanwhile, Satou's friend Shouko Hida goes to Taiyo's house and discovers his obsession with Shio, who he claims Satou has kidnapped. While in disbelief over what Taiyou has told her, Shouko is approached by Asahi. "We Revolve Around the Moon"
As Shouko starts to grow suspicious of Satou, she starts visiting Asahi on a regular basis to make sure he is fed. While speaking with Shouko about his search for Shio, Asahi recalls the hardships he went through to keep Shio and their mother safe from their abusive father. The next day, Shouko asks Satou to tell her the truth, to which Satou decides to take her to her place. Meanwhile, Kitaumekawa, who is convinced that Satou killed her aunt, decides to follow after her. "What the Sugar Girl is Made Out Of"
Feeling that Satou betrayed him by sharing her secret with someone else, Kitaumekawa calls over the police to her apartment just as she and Shouko arrive. To his surprise, however, the door is answered by Satou's aunt herself. Despite this person's disturbing behavior towards them, the police find nothing incriminating inside the apartment, which is later revealed to be a different one from the one Satou and Shio are living in. Satou recalls the first time she came to Apartment 1208, wanting to get away from her aunt while serving as a model for the owner's painting as thanks for giving her shelter from the rain. One day, as Satou found Shio on the way home from school and brought her to the apartment, the owner, angered by Satou's change in expression (as she was satisfied and he liked her when she was incomplete) attempted to kill Shio, only to be killed by Satou instead. This is what left the blood splatter on the wall in the back room. His cut-up body is what Satou made Kitaumekawa dispose of in episode two. Back in the present, Asahi gives Shouko encouragement following her experience with Satou's aunt, while Satou offers Taiyo an opportunity to see Shio if he leads Asahi out of town. Taiyo tries to convince Asahi to leave town by giving him Shio's tie that he had received from Satou. Despite warnings from Shouko not to trust Taiyo, Asahi decides to go as it is the only clue he has of his sister. The next day, as Satou and Shio make plans to have a wedding together, they are spotted by Shouko as she takes a picture of them with her cellphone. Unable to trust that she won’t tell the police about Shio, Satou kills Shouko by slitting her throat, unaware that she had managed to send the photo she took earlier to Asahi. "A Proposal Under a Starry Sky"
While trying to clean up the apartment for an exhausted Satou following Shouko's death, Shio recalls how her mother gradually went crazy from her husband's constant abuse and eventually abandoned her. Satou found her soon after. When Satou mentions they'll have to abandon their apartment, Shio lashes out at her over the secrets she kept from her, telling Satou she hates her. Recalling how they first met, Shio states she wants to protect Satou like she protects her, leading Satou to become honest about the sins she has committed and work together with Shio. "An Eternal Moment with You." Asahi confronts Taiyou about the photo Shouko sent him, ordering him to find Satou's address. Meanwhile, Satou reluctantly asks for her aunt's help in disposing of Shouko's body and providing a getaway for her and Shio. Hoping to have Shio to himself, Taiyou goes to the address listed in Satou's work profile, only to wind up at her aunt's apartment instead. She thinks he's here for love and sexually assaults him. The episode ends with Satou and Shio having a wedding ceremony in their apartment and sharing a kiss with each other. After packing up their belongings, Satou and Shio purchase their airplane tickets to leave the city; however Satou notices that she left her wedding ring back at the apartment so they go back to retrieve it. As Satou and Shio are about to leave the apartment together , they are confronted by Asahi, who had figured out their address from Shouko's photo. Satou first takes Shio to her aunt's apartment, but runs into a crazed Taiyou, who has freed himself and is escaping. They leave him to fall to the ground and go to the roof. Meanwhile, her aunt had set the entire 12th floor of the apartment ablaze and when Asahi goes to Satou's burning apartment, he finds Shouko dead inside. He finally confronts them on the roof, revealing to Shio their mother abandoned her so she would be away from her, having hit Shio and feared she was becoming like her husband. Then their mother poisoned their father. However, Shio remains determined to stay with Satou and die along with her. The two leap off the rooftop together. In the end, Satou dies protecting Shio, who keeps the love she had for her inside her, while Satou's aunt is arrested for arson and Shouko's murder. Taiyou is back home in a catatonic state after losing his "angel." Kitaumekawa is arrested, the information he was abusing students somehow leaked. Asahi visits Shio in the hospital, who is looking out the window at their mother, standing on the street looking back at her. Shio refuses her brother and states her love exists only inside her where the memory of Satou is. ^ The series is listed as premiering on July 13 at 25:55, which is the same as July 14 at 1:55 AM. ^ All English titles are taken from Amazon. ^ a b Sherman, Jennifer (March 21, 2018). "Happy Sugar Life Horror Manga Gets TV Anime in July". Anime News Network. Retrieved March 21, 2018. ^ a b c Sherman, Jennifer (April 20, 2018). "Happy Sugar Life Anime Casts Natsuki Hanae, Aya Suzaki, Yuichiro Umehara". Anime News Network. Retrieved April 20, 2018. ^ a b c d e f g Loo, Egan (March 21, 2018). "Happy Sugar Life Horror Anime Reveals Cast, Staff". Anime News Network. Retrieved March 21, 2018. ^ Hodgkins, Crystalyn (June 11, 2018). "Happy Sugar Life TV Anime Replaces Yuichiro Umehara With Kaito Ishikawa". Anime News Network. Retrieved June 11, 2018. ^ Sherman, Jennifer (May 21, 2018). "Happy Sugar Life Anime Casts Kikuko Inoue". Anime News Network. Retrieved May 21, 2018. ^ "「繰繰れ！コックリさん」こひなデザインのブックカバー、JOKERに". Natalie (in Japanese). May 22, 2015. Retrieved March 21, 2018. ^ Ressler, Karen (July 8, 2018). "Yen Press Licenses Happy Sugar Life, Kakegurui Twins Manga, Penguin Highway, Walk on Girl, Mirai, Dive!! Novels". Anime News Network. Retrieved July 8, 2018. ^ "ハッピーシュガーライフ 1". Square Enix (in Japanese). Retrieved May 20, 2018. ^ "ハッピーシュガーライフ 2". Square Enix (in Japanese). Retrieved May 20, 2018. ^ "ハッピーシュガーライフ 3". Square Enix (in Japanese). Retrieved May 20, 2018. ^ "ハッピーシュガーライフ 4". Square Enix (in Japanese). Retrieved May 20, 2018. ^ "ハッピーシュガーライフ 5". Square Enix (in Japanese). Retrieved May 20, 2018. ^ "ハッピーシュガーライフ 6". Square Enix (in Japanese). Retrieved May 20, 2018. ^ "ハッピーシュガーライフ 7". Square Enix (in Japanese). Retrieved May 20, 2018. ^ "ハッピーシュガーライフ 8". Square Enix (in Japanese). Retrieved June 11, 2018. ^ Hodgkins, Crystalyn (May 20, 2018). "ReoNa Performs Ending Theme for Happy Sugar Life Anime". Anime News Network. Retrieved May 20, 2018. ^ a b c Hodgkins, Crystalyn (June 1, 2018). "Happy Sugar Life Anime's 2nd Promo Video Reveals July 13 Premiere". Anime News Network. Retrieved June 1, 2018. ^ Hodgkins, Crystalyn (July 14, 2018). "Happy Sugar Life Anime Listed With 12 Episodes". Anime News Network. Retrieved July 14, 2018. This page was last edited on 15 April 2019, at 02:14 (UTC).